Weekly, we connect in Life Groups to encourage one another as we follow Jesus. 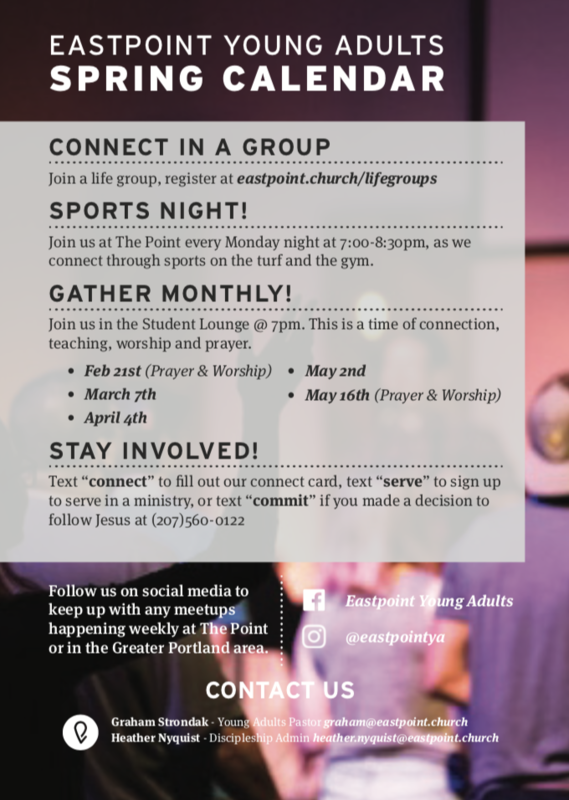 Every Monday, we meet at The Point for sports nights, including soccer, frisbee, and more! Monthly, we have a Gathering where we come together as a whole ministry to make new friends, worship, and engage in a teaching from Scripture. Quarterly, we meet for our All Worship and Prayer Nights. We believe that following Jesus is better when we do it together. We encourage everyone to sign up for a Life Group or a class to help get connected and grow deeper in your faith. Check out our groups and classes for our Fall semester and register today by clicking here! WANT TO FOLLOW ALONG WITH OUR MESSAGES? JUST CLICK HERE! Check out the messages from our previous Young Adults Gatherings below!